Have I finally bitten off more than I can chew? I think so. The blog hasn’t been updated as frequently as it should be, emails are going unacknowledged for days or even weeks, and I’ve been shelving good & interesting projects simply because I don’t have time anymore. It’s an abundance of riches in a sense —too much work to do when other folks are still looking for some, and (briefly) too many friends overflowing the driveway into the street—but drowning is still a bad thing even if it’s in a vat of hot chocolate with marshmallows. So I’m making some tough decisions. Brett and I went off to Palm Springs on Thursday with the decision that we would regretfully resign our volunteer positions as “Event Captains” once the weekend was over. We’ve enjoyed organizing the Vintage Trailer Show for the past two years, but it’s time to hand the reins over to someone else, and we are lucky that a friend in the vintage trailer community has already expressed tentative interest in managing the show for 2013. The actual Vintage Trailer Show this weekend was fantastic. The final count of visitors was 1,935, which is a record for this event. I was asked a few times why an owner would want to display in this show (and pay for the privilege) rather than just going to a vintage trailer rally elsewhere. I think the volume of visitors explains why. Nowhere else will you see such a huge volume of people who are avidly interested in your trailer, and if that’s useful or important to you, Palm Springs is indisputably the place to be. The photo above shows Randy and Jeannet Grubb in their one-of-a-kind “Decoliner,” which was one of the stars of the show. It has a full upper deck from which you can drive the rig. It’s for sale, and it would make an awesome promotion vehicle for those who can afford it. My photos really don’t do justice to the event, and most of them were taken for very specific future uses, so if you want to get a better look, check out Alison Turner’s blog. That’s a picture of Alison coming down the steps of the Decoliner. It was great to see Alison, as well as Dan & Marlene of Malimish, blog readers Kristiano and Christy, Bert Gildart (see his pictures from the event here), and about 1,930 other people. All in all, it was a fine road trip. We met a lot of great people, enjoyed some superb weather, and had a fantastic 800 mile speed run across the southwestern desert, which always makes me happy. We really couldn’t have hoped for a better weekend. Next year, since we won’t be organizers, we’ll just attend the show like everyone else and that will be even nicer. I’ll be able to bring a “date” along (guess who) and actually enjoy Palm Springs like a tourist. Being back home now, it’s time to plunge into the remaining list of tasks. I’m already behind the curve on the Summer 2012 issue at a time when I should have it mostly wrapped up and be planning out Fall 2012. That’s enough to make me nervous but then atop it I have lots of work to do on Alumafandango, Alumapalooza, and a third event that we hope to launch in 2013. Speaking of Alumafandango (our Denver event), you might have gotten an email today that says if you register for it on Wednesday February 29, you can get a free Alumafandango t-shirt. Just enter the code “LEAPDAY” when you choose your shirt size. This code will only work on February 29. I occasionally think that we have too many Airstreams, but sometimes we don’t have enough. This is the time of year when people tend to come visit (guess why) and the Airstreams become very useful as guest houses. We live in a three bedroom house that is in a perpetual state of construction and has only two usable bedrooms, and 1.5 usable baths. I don’t even have an office that I can use, just a desk in the corner of the living room. So we aren’t well set up for having overnight guests, at least not indoors. This has never been a problem for the dozen or so houseguests who visit each season, because the Airstream makes a far better place for them to stay. We tell prospective visitors that they will be welcome to stay “in the Airstream in the carport.” This is a sort of test. Those who are intimidated by the idea of sleeping in a trailer, parked next to the car and tool shed, would probably be happier in a hotel. Most of our friends have the opposite response. 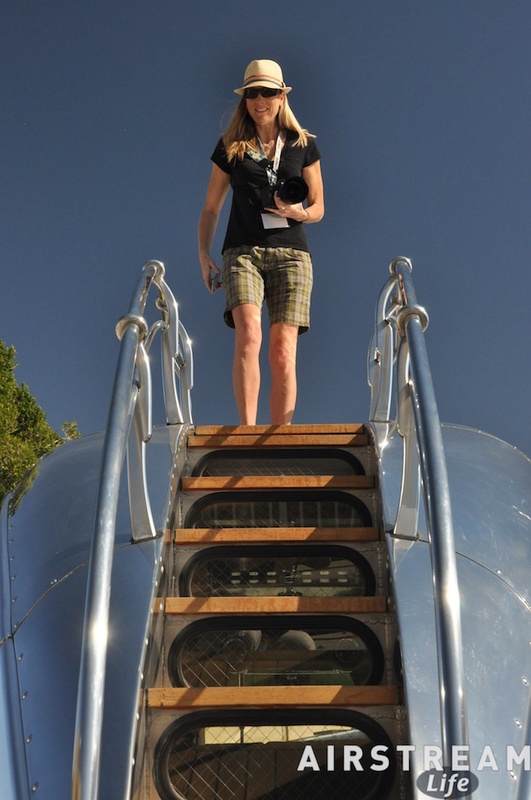 They say, “Oh cool, I get to sleep in the Airstream?” and then we know that they’ll be great house guests. This week we have a full house. 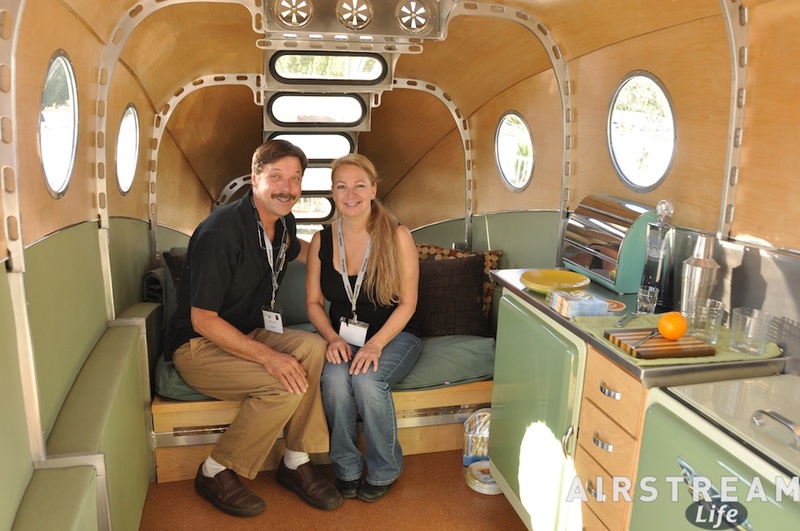 Lou & Larry have arrived in their 30-foot Airstream and are parked in front of the house. We have courtesy-parked at their place in Ohio many times, and this is the first chance we’ve had to reciprocate. They will be here a couple of nights and then head to California to visit Bert & Janie at their boondock site in Anza-Borrego (and Michael Depraida at his spot at “The Slabs” near the Salton Sea), and then come back here for a few more nights. Tomorrow, a long-time friend of Eleanor’s will fly in from the northeast, and she’ll be accommodated in the Safari. That trailer is like having your own apartment, since it is roomy, stocked with everything you could possibly need, and fully hooked up to utilities. The same day, Brett will fly in from Florida, and he’ll be set up in the smaller Caravel. So we’ll have four guests at once, across three Airstreams. This works out really well. Everyone has a space to call their own. We don’t have to worry about whose towel is whose, or when people like to get out of bed. Everyone has their own refrigerator, stocked with the things they like to eat. Everyone has their own bathroom, and can set the temperature where they like it. Lots of those opportunities for friction (even between good friends) are eliminated, and we all get to focus on the good parts of visiting. It’s financially very practical too. We don’t need a big house just for those occasions when people visit. There are no unnecessary rooms to dust or pay taxes on. When our guests are gone, the “guest houses” revert to being our vacation and business vehicles, or I can use one of them as a private office when I need a quiet space to work. 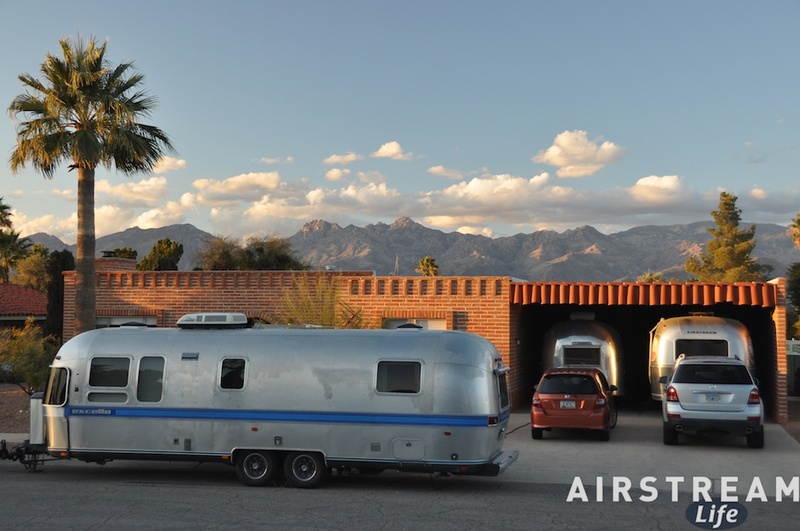 The Airstreams make our little house much more flexible and affordable. I may someday get a plaque for our Airstream Safari’s bedroom that lists all the people who slept there. (That ought to freak a few people out during tours.) I think a few of them stayed specifically because they could sleep in the Airstream. It is an attraction, to some folks. Time slowed to a near standstill for me last week, when I was suddenly struck down by one of those cruel stomach bugs. You know the type. I was in the car with Eleanor and complaining that her erratic driving was making me carsick, but it wasn’t her driving at all. A few minutes later we were sitting in the car talking while Emma finished up her karate class, and then alarms went off in my lower intestines. A minute later I was crumpled in the parking lot, trying not to puke on the pavement while the karate moms watched. There’s something about the nature of an abdominal illness that quickly reduces your personal pride to a level you did not previously think you could reach. I was overcome by an urgent desire to lie flat, even on the ground amongst the dirty asphalt and cigarette butts, if only that would alleviate my distress. I broke out into cold sweat and shivered with chills. It had come out of nowhere, and there was absolutely nothing to do for it but get home as quickly as possible. I spent the rest of the evening and the night shaking and groaning. Whatever had struck me, my body wanted it out as quickly as possible. This is a time when all of your pride, all of your possessions, all of your social status are stripped away. At the moment when your guts are twisting there’s little to think about except surviving to kneel on the cool tile floor of the bathroom. It doesn’t matter if an few hours earlier you were flying on your private jet, returning from a sun-filled weekend on the beach with a harem of bikini-clad masseuses. In the cold dark night, as chills rack your body, you can finally appreciate what older folks meant when they said, “At least you’ve got your health.” We are all equal in the world of the stomach virus. It was late morning before I was able to contemplate anything other than clear liquids, and a full day beyond that before I felt well again. When we were full-timing, this was one of the nightmare scenarios for me. Being incapacitated myself would be an inconvenience, but Eleanor and I had a simple plan: we’d pull over at the first available opportunity and wait it out, no matter where we were. This strategy occasionally resulted in being stopped in some odd places, but usually when someone was getting sick we had enough warning to find a decent campground. No, my nightmare scenario was either “E” or “e” getting sick suddenly. That scared me a lot more. When Emma was a tyke we watched several times as she was knocked flat by those viruses that little kids get, and each time it was horrible to see. This is a situation that all parents end up in; it’s just a little tougher when you’re away from familiar health care. Emma’s pediatrician was always on speed-dial, and we learned to mentally note the location of the nearest hospital or urgent care center as we rolled into town, a habit that sticks with me even today. The illnesses that we have dealt with to date in our travels have been fairly garden-variety (colds, migraines, cuts). Fortunately we never needed the hospital, but we came close once in Florida when Eleanor sustained a massive migraine that lasted an unusually long time. I found a full-hookup campground and covered the trailer with blankets to dim the interior to near-total darkness during the day. We ended up at an urgent care center. It ended well, eventually, but the experience was fair warning that anyone, at any time, can suddenly run out of time. What’s to do about that? Nothing, except go on with life. If anything, this reminded us how lucky we were to be traveling, because so many other people we knew had missed their chance and were now stuck at home with medical conditions that prevented them from traveling. Eleanor’s father wanted to buy an Airstream and visit all the national parks, but he died before retirement—and he’s just one of many examples. I wouldn’t say “live every day like it’s your last,” because you’d quickly run out of money and probably catch a venereal disease, but at least live every year like you might not get another one. This is harder than it seems, especially when health concerns have already caught up you. I’m always impressed by those who have such severe wanderlust that they manage to overcome difficult illnesses and see the country anyway. We know people afflicted with Multiple Sclerosis, people on dialysis, people in wheelchairs, and some who can barely see, but with the assistance of their partners are getting out there to explore their dreams and make new friends. It makes my tiny bout with a “24 hour bug” seem hardly worth considering. We launched Alumafandango last week and I was pleasantly surprised by the response. In the first week we signed up 11 trailers, which is impressive for a new event, especially since we have very little information up on the website yet. People seem to be signing up for it on the strength of the reputation of Alumapalooza, which is nice but it also makes me more acutely aware that we’ve got to put on something really exceptional. And so I spent much of the week anxiously trying to organize the details of Alumafandango. We want everyone to be completely mesmerized by the experience, to the point that (like our other events) there’s never any desire to leave the grounds to find something else to do. That’s a tall order. I expect Brett & I will be busy programming the event for the next few months, even while we are finalizing details for Alumapalooza 2012 in Ohio. At this point we have just one space left in the show, which will probably get snapped up in the next week or so. We’re expecting some special guests to join us, including vintage trailer restoration specialists Mike Keenan of M.E.L. Trailers, David Winick, and Uwe Salwender of Area 63 Productions. We really do like organizing these shows, but we’ve got to stick to the core business of running Airstream Life and our own events (AFD/APZ), so this will be the last year Brett & I are involved in curating the Modernism Week show. We’ll hand the reins over to someone else once this show is done, and hopefully it will continue growing as a special event. I’ll probably still come out to Palm Springs in future years just to attend and see what’s on display, as it is a unique chance to see some of the best vintage trailers in the west.